The Bruce Cliffton Ponderosa Maple 3/8 in. Thick x 5 in. Wide x Random Length Engineered Hardwood Flooring comes prefinished in a medium color with a satin gloss. The planks have a micro-bevel on all 4 sides. 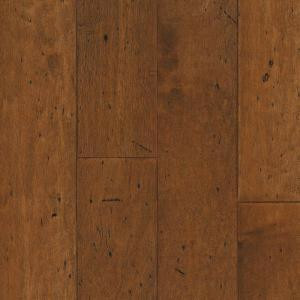 It is constructed with 5 ply cross grain engineered wood. The wood has a very high Janka wood hardness rating/resistance to denting of 1,450. It is appropriate for installation above, on or below grade. 25 sq. ft. per case. Case weight: 42 lb.